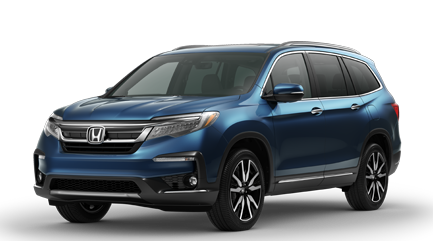 Check out the updated 2019 Honda Pilot in New York or New Jersey. Honda engineers outdid themselves with the Honda Pilot design, as it is now the winner of the IIHS top safety pick for 2019. You can learn more about this honor by going to Honda's main website. It's no secret that the Pilot has been setting the standard for modern SUVs for years. Thanks to the Pilot's new safety systems, that bar is now going even higher. We encourage drivers in New York and New Jersey to stop by and explore our selection of new SUVs for sale at our dealerships! For 2019, The Pilot offers front and rear LED lights, aerodynamic body lines, and 10" alloy wheels. Drivers can now get where they're going with a design that is fluid and efficient, which complements features like the Pilot's EarthDream engine. If you're on the hunt for a quality new SUV, then you're probably looking for a sturdy design that's flexible. Luckily, Honda's Pilot SUV comes with tons of features that make it highly configurable. Drivers love the Pilot for its available 2nd-row captain's chairs and one-touch power moonroof. Whether you're moving across town or you're grabbing the whole family for a road trip, the new Pilot will come in handy! The new Pilot is made for every driver who wants access to a premium audio system. Pilot owners and their passengers never have to worry about wasting data on the go, thanks to the available wi-fi from AT&T. The Pilot also offers a Qi phone charger and uses CabinTalk for rear passengers. The new Pilot is the SUV of the future. Check out Honda Sensing® Safety, which brings forth tons of systems that help the driver watch the road. The Pilot offers an extra set of eyes as you go from place to place. Systems like lane keeping assist and adaptive cruise control ensure that the driver can enjoy all of the peace of mind they desire. Contact us now to learn more about the Pilot and its safety systems. We encourage drivers from New York or New Jersey to come to our dealerships. You will find quality SUVs for sale, like the Pilot, on our lots. Ask about our finance applications and lease specials! You won't want to miss out on our exclusive DCH Auto Group savings.